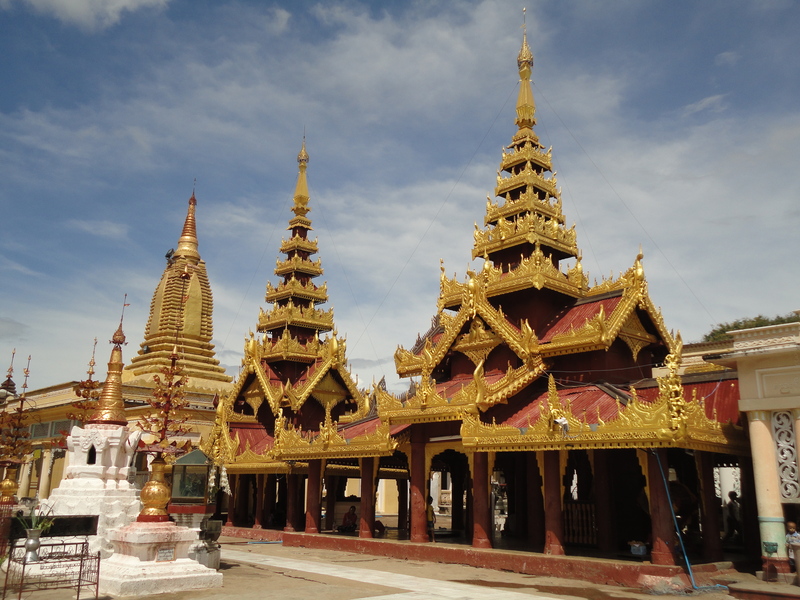 The name Mandalay is famously associated with exoticism due to Rudyard Kipling’s poem and glamour from the Las Vegas casino, but Myanmar’s second city and former royal capital unfortunately doesn’t have much of both in my opinion. 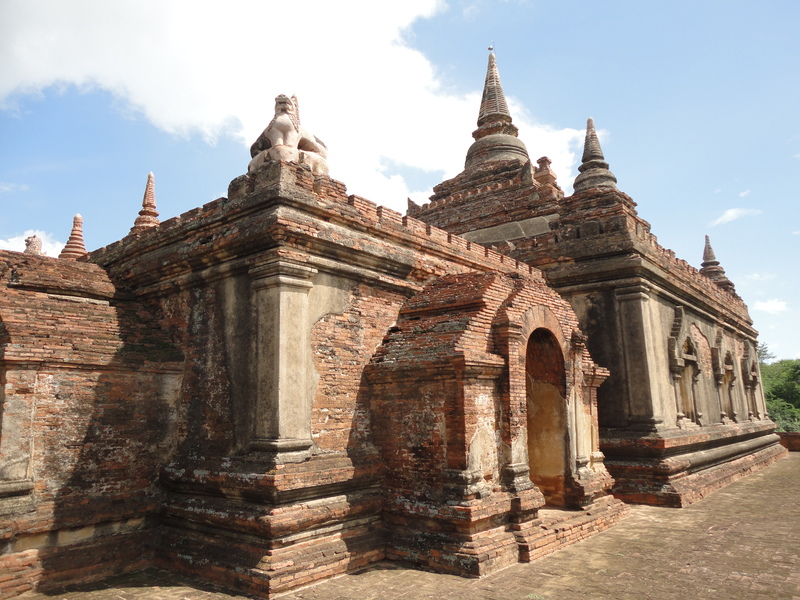 What it does have is a number of varied historical sights around it, being surrounded by several old capitals (Burmese history is complex) – Inwa, Sagaing and Amarapura. 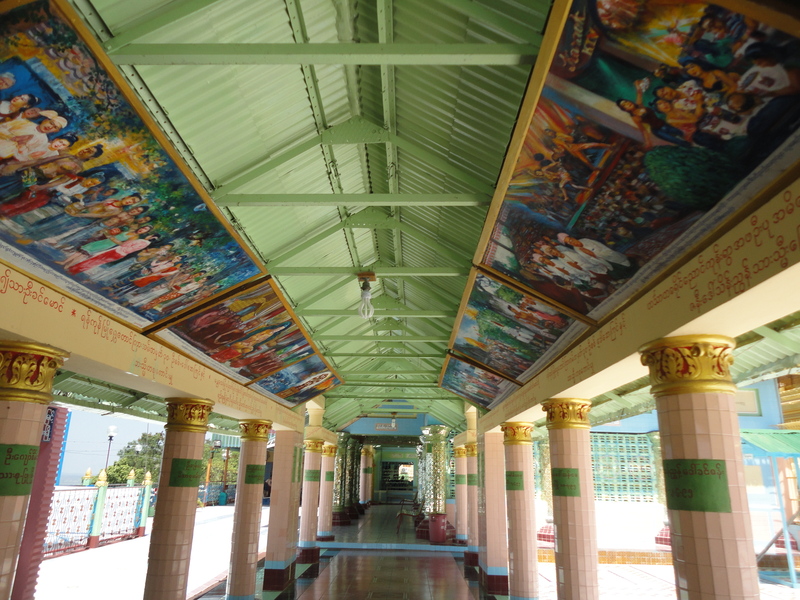 These towns (the latter two) and village (the former) don’t exactly have their former prestige but they feature impressive monasteries, the world’s longest teak bridge and a pleasant hill covered with temples. Mandalay itself does have a massive palace complex surrounded by a moat, though almost all the buildings are reproductions since most of the palace was destroyed by bombing raids during World War II, which is why I didn’t bother to visit it. 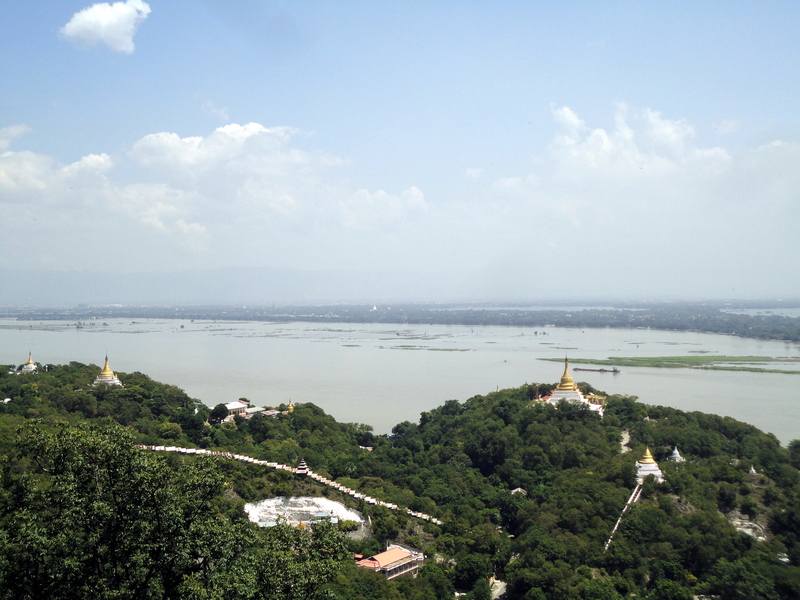 Instead, I went to Mandalay Hill, which isn’t that high but has fine sweeping views of the city, the Irrawady River, and the mountains to the north and east. However, Mandalay is considered the country’s cultural hub and contains a lot of artists, craftsmen and jewelry artisans, which I didn’t have the time to check out, and which might have made me appreciate the city more. 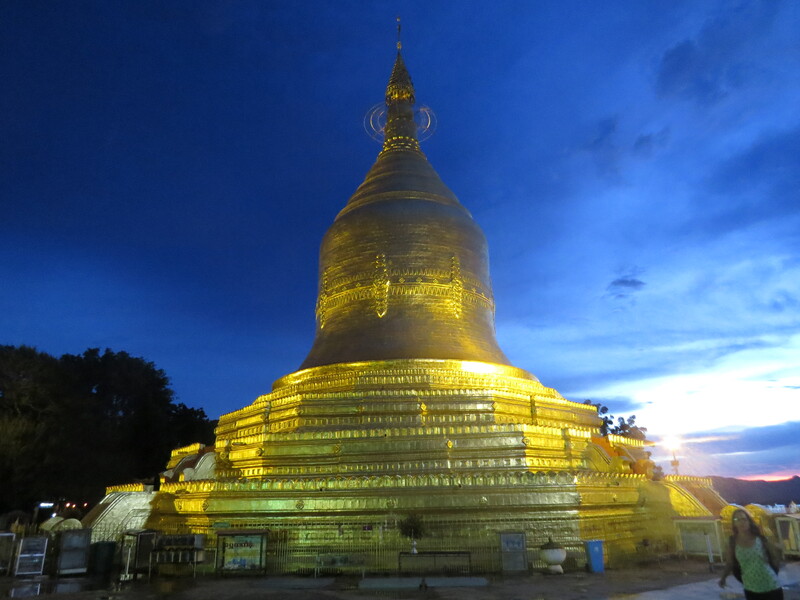 Instead, I went on a full-day tour of the three former capitals and the next day, I visited Mandalay Hill and a couple of temples in the city, before leaving at night to return to Yangon. Mandalay is not as filled with vehicular traffic like Yangon, but it still has a lot of old, noisy motorcycles and antique buses. 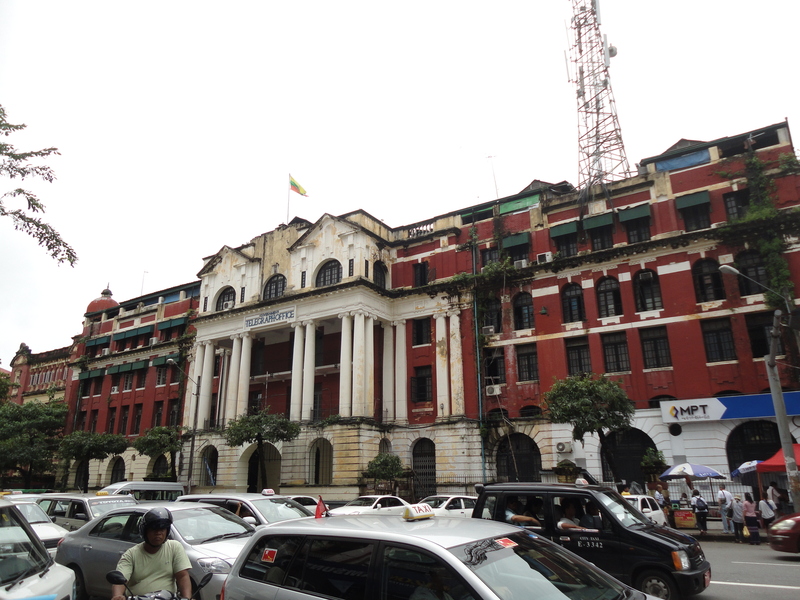 It also does not boast Yangon’s old colonial buildings though it seemed older and less prosperous. The neighborhood where I stayed in was a mix of decent and rundown streets and there was a Buddhist temple right behind my hotel, which always had a large number of locals sitting in the front, one of whom was my driver for my two trips. The first stop was to Mahagandayon monastery in the morning where the star attraction was seeing the monastery’s hundreds of monks march to the dining hall for breakfast. The monks ranged from kids to teenagers to middle-aged people and they stoically put up with tourists like me standing at the side snapping away. It sounds a little exploitative but it is a known tourist attraction and the monastery does not seem to mind. 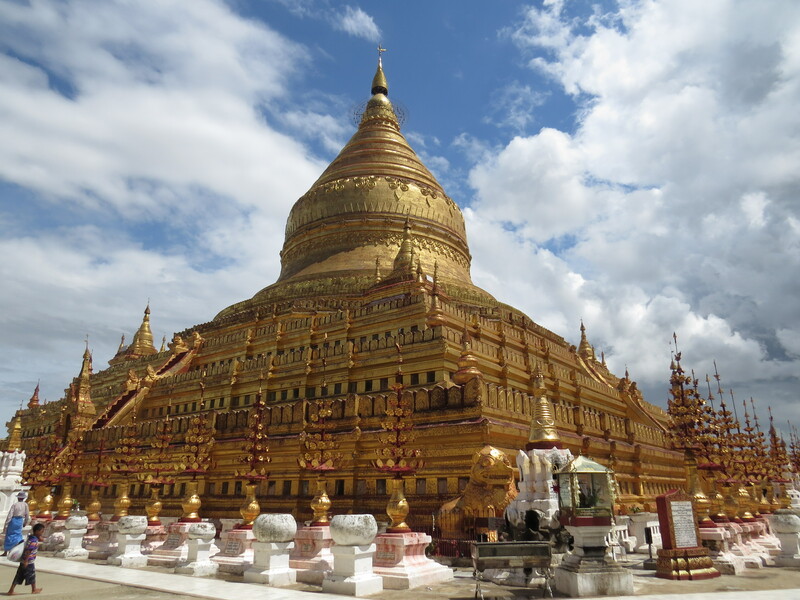 The Burmese are a very religious people who take their Buddhism seriously which can also be seen from the large number of Buddhist temples everywhere, including hill tops. I would later learn from my driver Joker (that was seriously his name) that becoming a monk for a short time was a rite of passage for most Burmese boys, hence the number of youngsters and teenagers in the procession. Joker himself had done it for a month in his village’s monastery when he was a child. 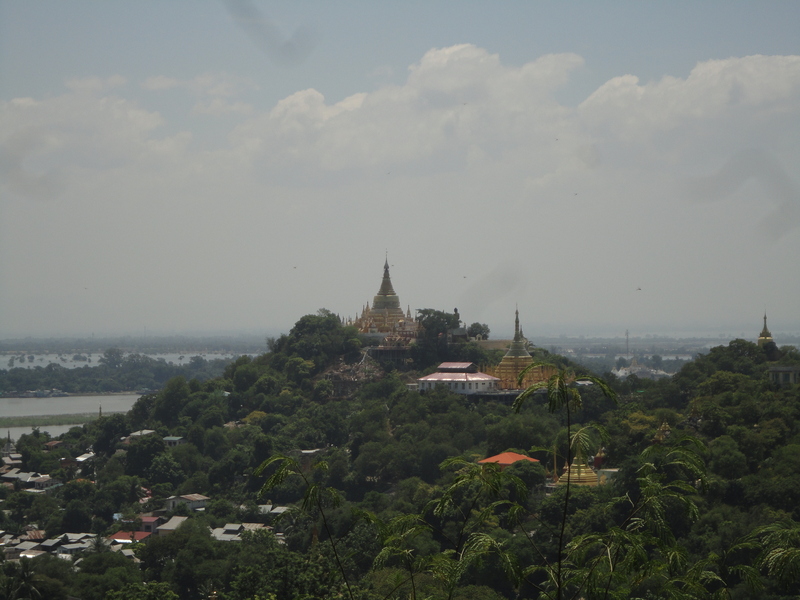 We then went to Sagaing and its temple-covered hill. The town was a former capital of a kingdom in the 14th century and briefly the national capital. 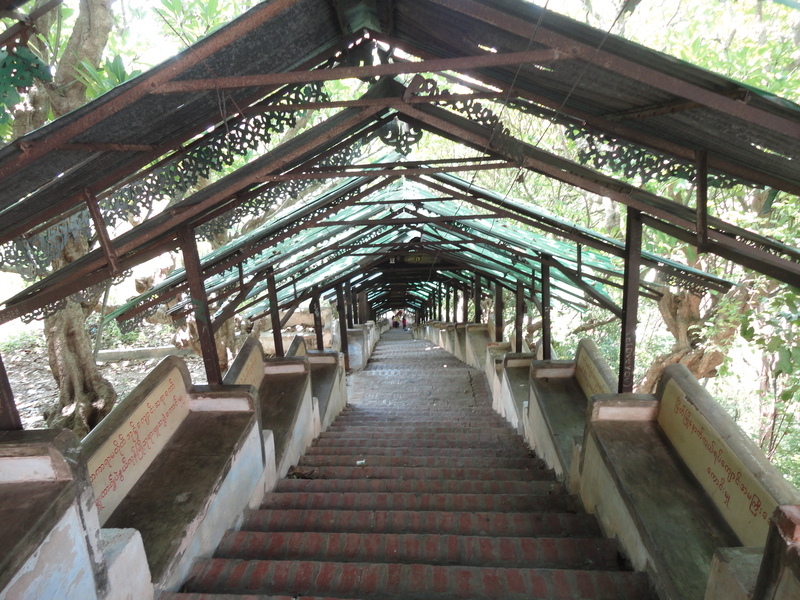 Walking up a covered stairway that went straight to the top, and my first hike in a year since I had my foot surgery, I reached the large temple on top. There was a nice view of temples and the Irrawady River below and the large teak transport ships carrying their cargo of massive logs down towards Yangon. There was the amusing sight of locals getting excited by white tourists and rushing to take photos with them, something that still happens in China. 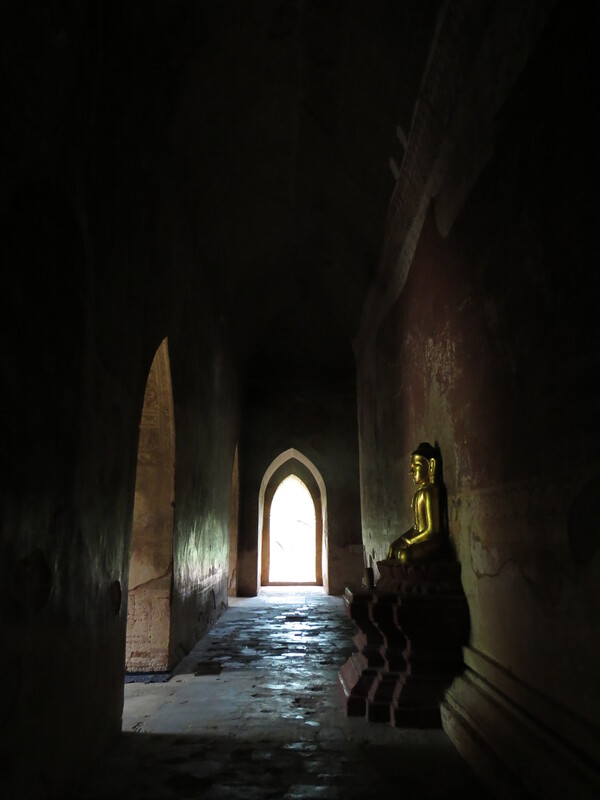 Inwa was the next stop. Here, my driver dropped me off by a riverside restaurant where I ate at before getting onto a boat to go across to Inwa. I initially thought Inwa was an island but instead it is a village located on the opposite side of the riverbank from which it was faster to cross by boat than by bridge, which was lower down. 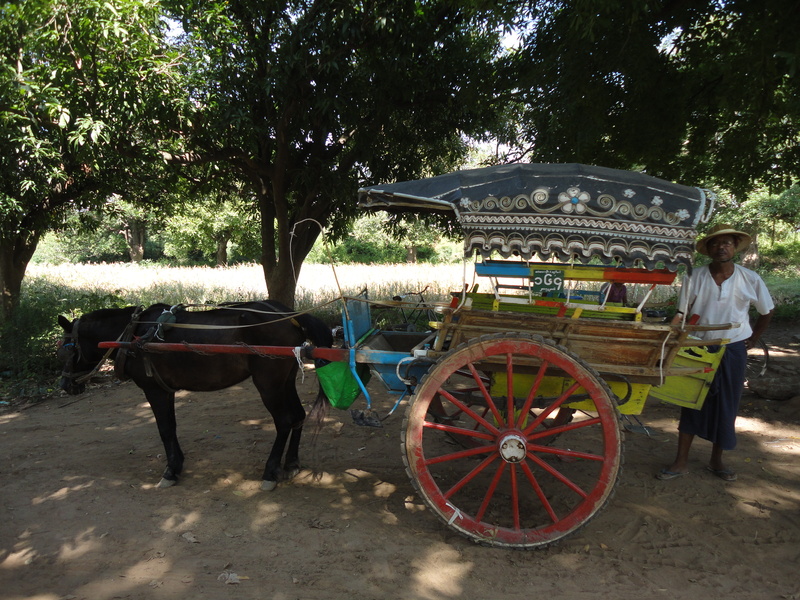 When I got off the boat on Inwa, I saw several horse-led carts and their drivers, the regular method of transport for tourists. 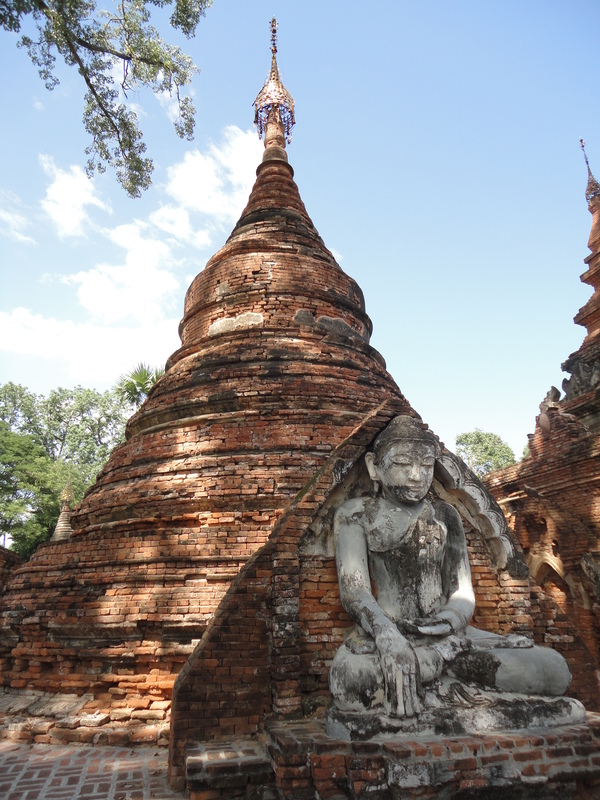 I chose one and subsequently endured over an hour of a rickety horse-cart ride to Inwa’s famous landmarks – a teak monastery, the stone remains of a temple surrounded by rice patty fields and a watchtower that was the only remnant of a royal palace. The wooden village houses were just as interesting. It was a strange experience being taken around on a rocking horse cart around a rural village that was supposedly a royal capital up until the 19th century when a massive earthquake forced it to be abandoned. While the views were fine, it wasn’t so nice seeing how the horses were treated. For instance, my driver whipped our horse every minute or so during our journey and I saw a few horses on the side of the road that were in rough shape with haggard looks, open cuts on their legs and mangy skin. Unfortunately, this was Southeast Asia and animal rights is not exactly a widespread concept. 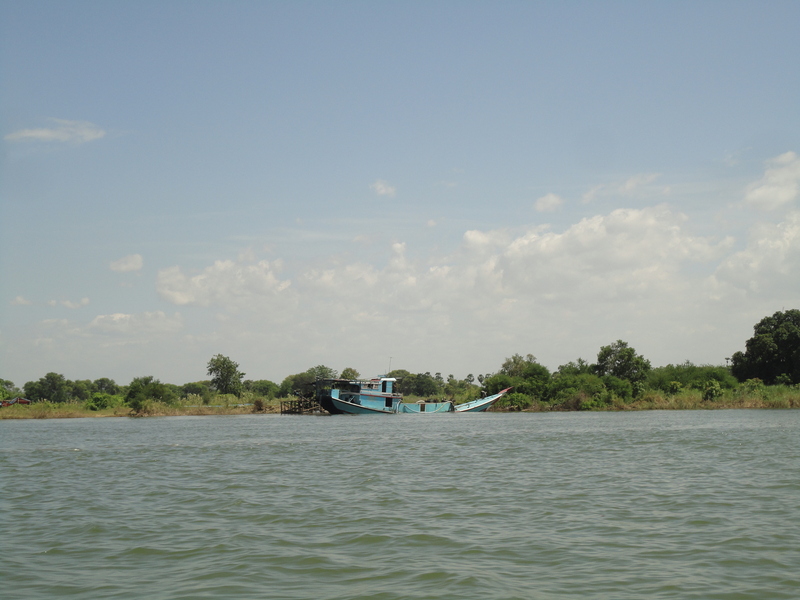 After I took the boat back to shore, Joker picked me up and drove me back to Amarapura to a spectacular all-white temple which is indeed named in the Lonely Planet guide, but I am unable to Google for. 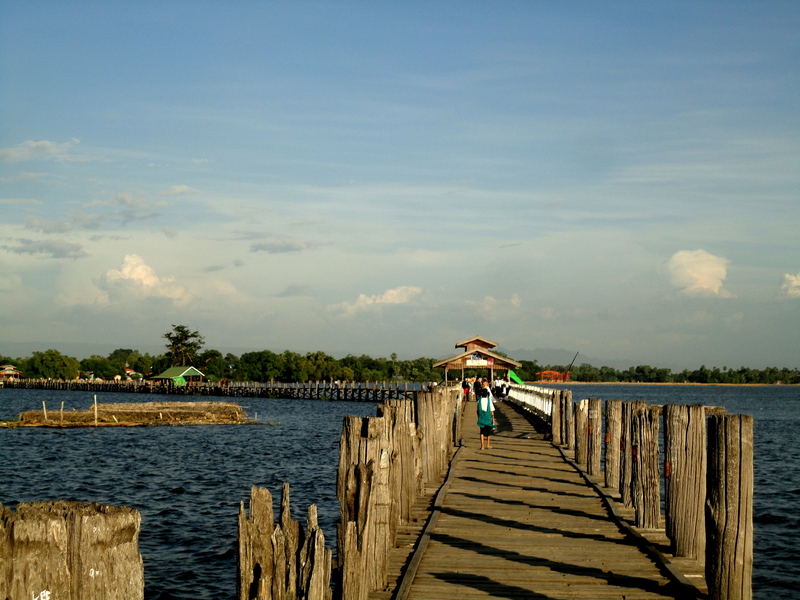 Finally, we went to the 1.2km U Bein bridge, the longest wooden bridge in the world and a great place to view the sunset. 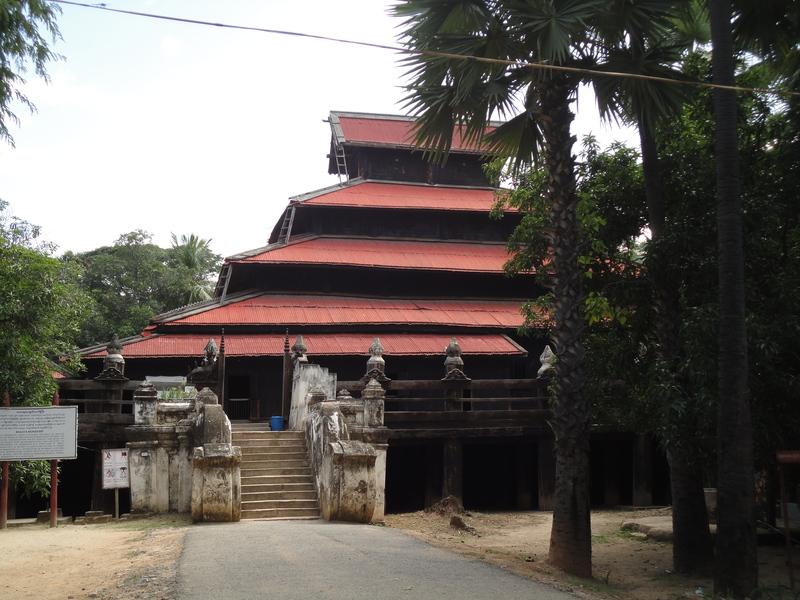 The bridge is supported by wooden pillars and has roofed huts and pavilions in between. I walked across the bridge, took a short stroll around the village on the other side, and came back over. I still had an hour to spare and it was just too damn hot plus I was tired from being out the whole day, so I found my driver. As we drove away from the bridge, with the river on one side and a swamp on the other side with very murky water, I was surprised to see lots of shacks. Living just minutes from one of the area’s biggest tourist attractions, those poor folk and their swamp slum were a stark reminder of the poverty in the country. The news about Myanmar has been stunningly positive in recent years, with the sudden opening-up of the country to the West, the release of Aung San Suu Kyi from house arrest and the elections in February, which the Nobel Peace Prize laureate’s party won overwhelmingly. Yet it wasn’t so long ago when Myanmar was one of the world’s bleakest places, almost on par with North Korea. Under decades of military authoritarianism, the country became poverty-stricken and repressed with its people under constant surveillance from authorities and information heavily censored. The people didn’t need to read Nineteen Eighty-Four, they were living it and many were fully aware of it. Even as the author was questioned and followed by government officials, she held many conversations with friends and strangers about the country’s politics. Almost everyone furtively tells the author how terrible the country has been under the military regime. “The British may have sucked our blood, but these Burmese generals are biting us to the bone!” an elderly man tells the author. Things were so bad in the country that the author, a Bangkok-based American who speaks Burmese, uses a pseudonym, Emma Larkin, to write her books. 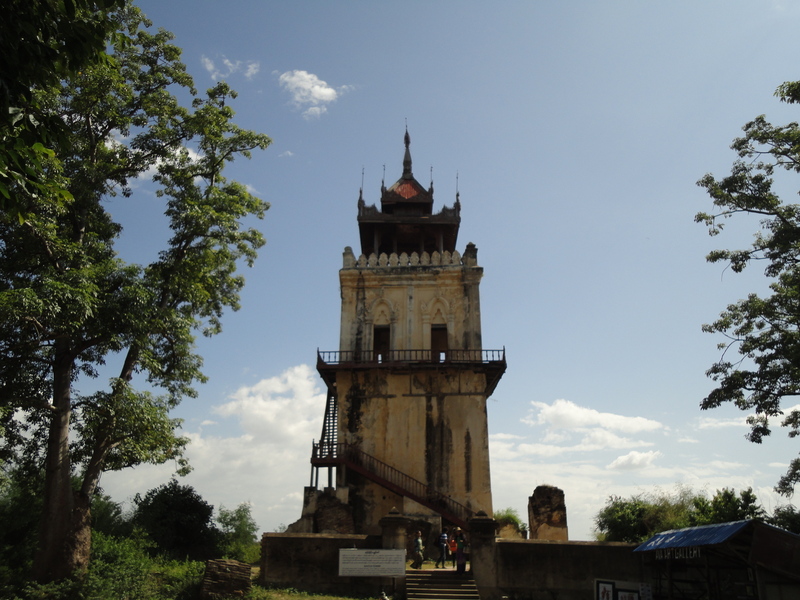 Larkin travels to each of the places Orwell was posted in – the former royal capital Mandalay, the Delta, Rangoon (now Yangon), Moulmein (now Mawlamyine) and Katha. 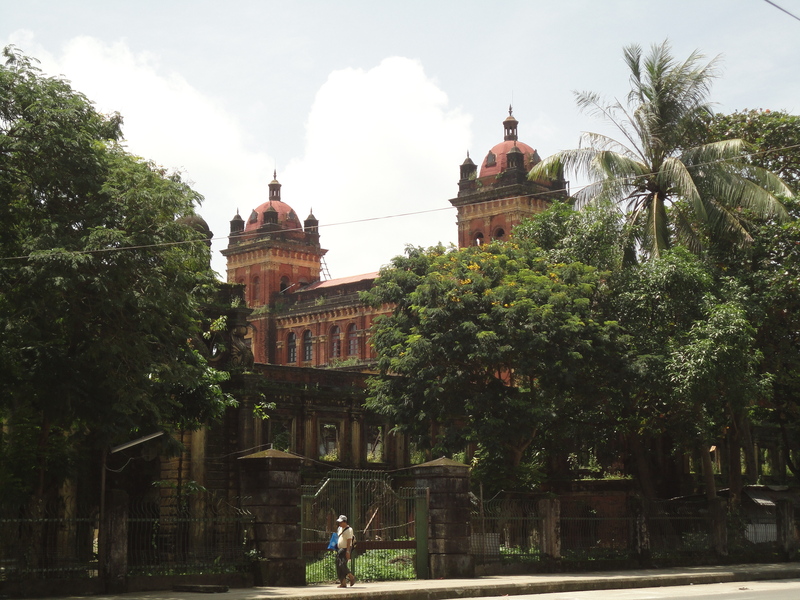 She tries to imagine how Orwell was influenced and inspired by his experiences to the extent he became more cynical about the British Empire through how it ruled Burma. Having gradually annexed the country and overthrown the monarchy, the British also abolished traditional institutions that helped run the country like the monks and replaced them with colonial officers. Orwell completely changed his view on empire and decided to become a writer after going on leave from his post in Burma. In the end, Larkin didn’t come close to finding out exactly what pushed Orwell’s transformation but it is easy to see how it might have been a gradual process. And this change was for the better because Orwell would write about the underclass and the poor, and eventually his masterpieces about communism and totalitarianism. It is a profoundly sad book that is thankfully about a time that has passed. But I wonder whether the Burmese people could have so easily forgotten all the terror of the past or if it still lurks in the back of their minds and hearts. When I visited there, many of the people were courteous and restrained and it was almost unimaginable that just years before, they had lived through terrible repression. 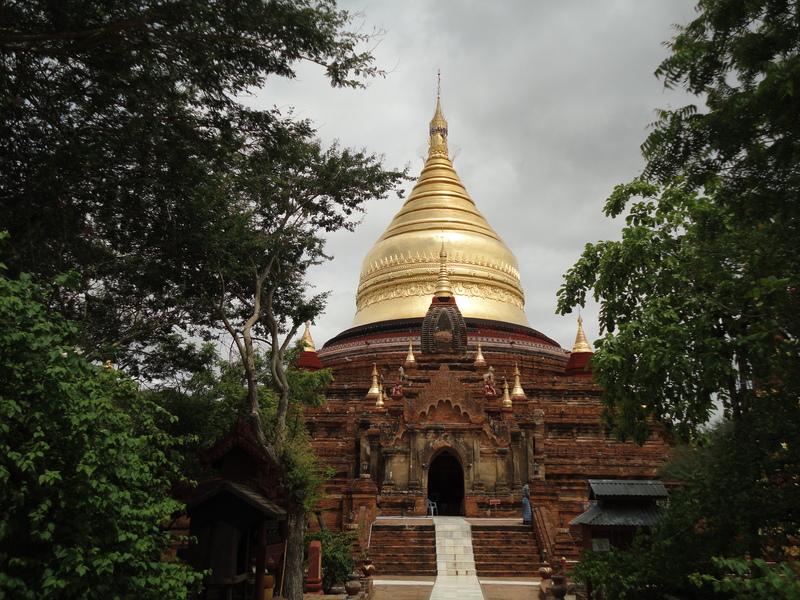 Because we all can’t get enough of Bagan, here’s a second photo roundup post of its myriad ancient temples. These boxy buildings were storehouses, according to someone I asked. 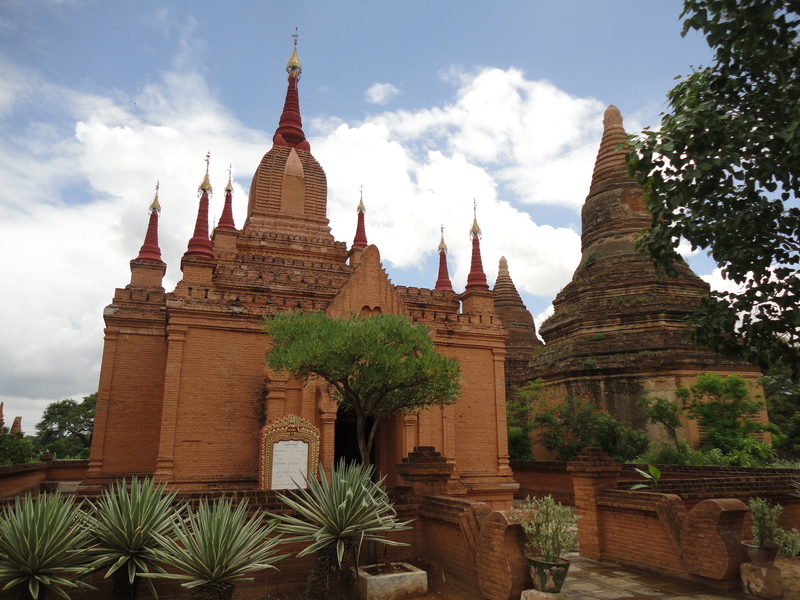 Please enjoy more photos of Bagan’s ancient temples and pagodas. 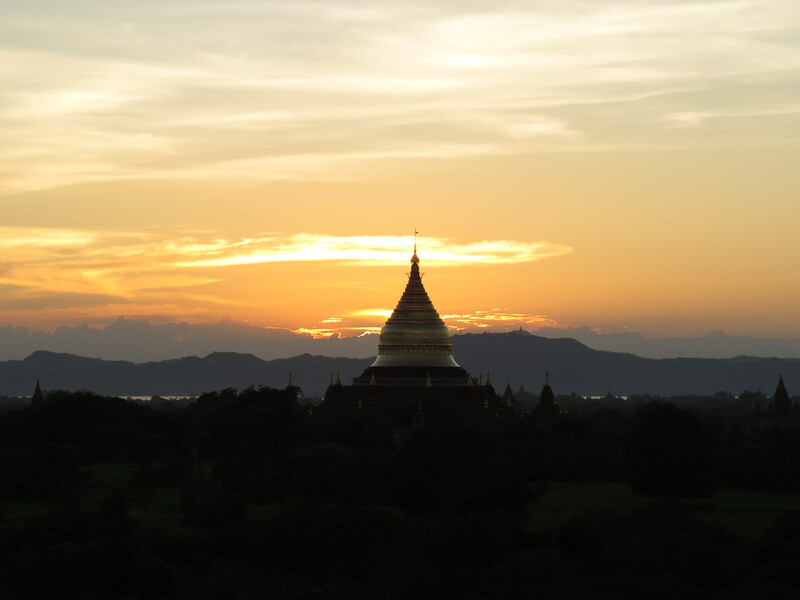 One of Myanmar’s most impressive sights is the thousands of ancient pyramidal temples studded across a wide plain next to the Irrawady river. 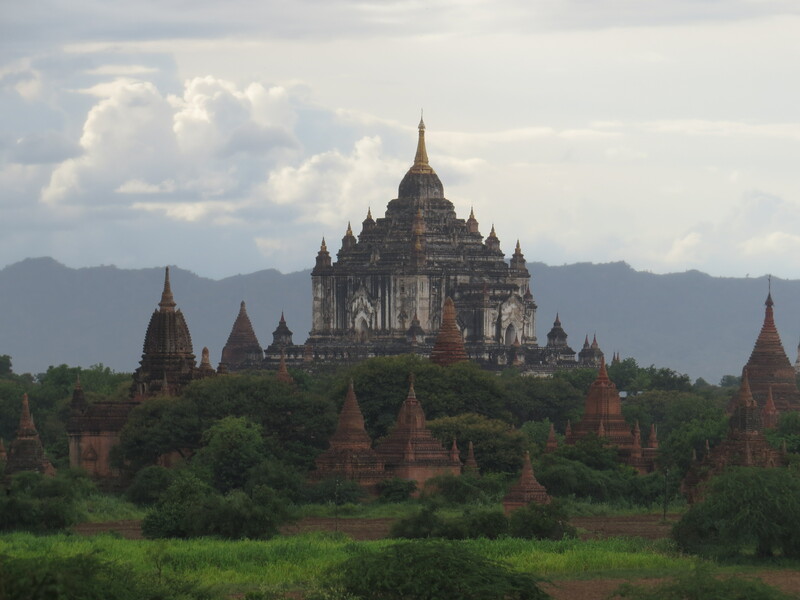 These are the ruins of Bagan, the country’s answer to Angkor in Cambodia. 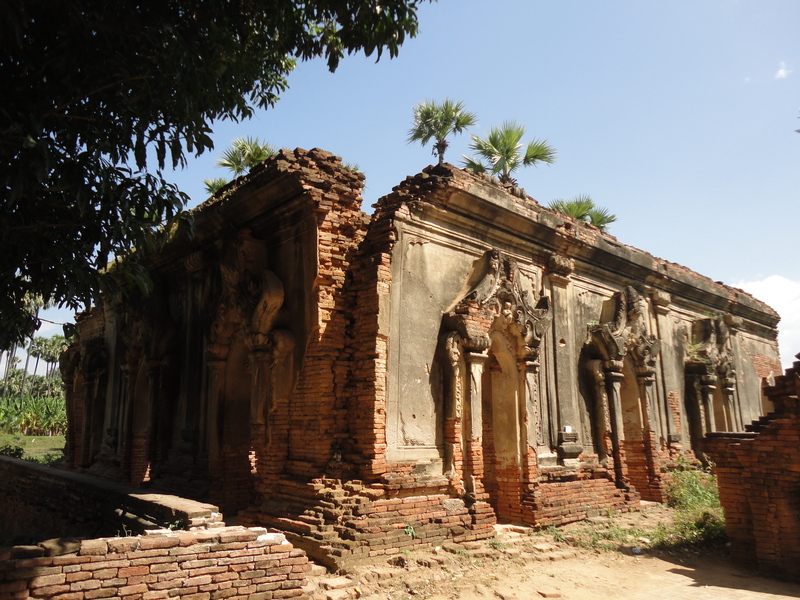 But whereas Angkor lies amongst forests and many of its structures are in a state of destruction, Bagan’s temples and pagodas are all in plain sight and many are relatively intact, thanks to intensive recent renovations. 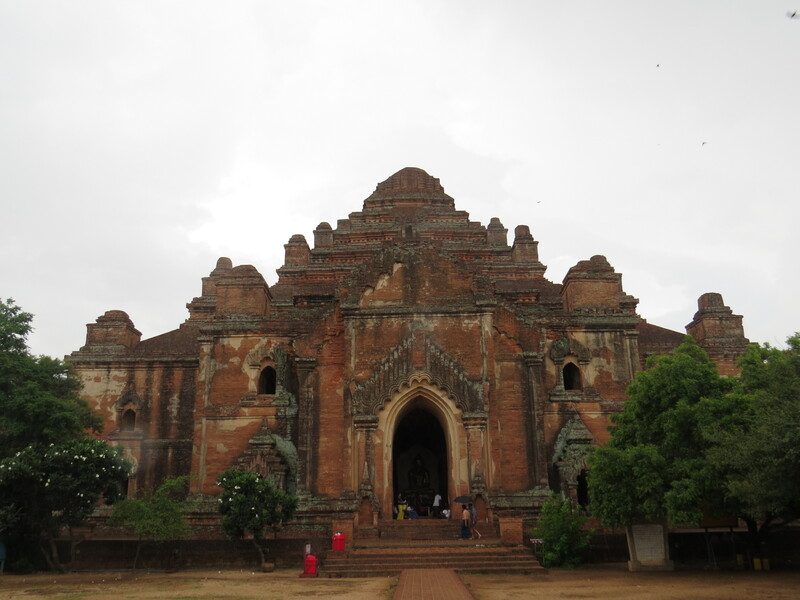 Built between the 11th and 13th centuries when Bagan was the capital of the Kingdom of Pagan, the first to rule over most of what would become Myanmar, the temples initially numbered over 10,000, but “only” 2,000 remain today. Besides the sheer number of temples, what might strike you is the different sizes and styles, ranging from massive multi-level domed “fortresses” to spire-topped pyramids to garden-shed-sized pagodas. Apparently the larger ones were built or financed by royalty and noblemen, while wealthy people and commoners built the smaller ones. Many resemble pyramids, but with outer levels you can walk around on, while some are square shaped and look like formidable fortresses. Also, most of the temples are clay-colored, but some are white, which I found to be more attractive, even and especially with the very apparent black stains of weather damage. 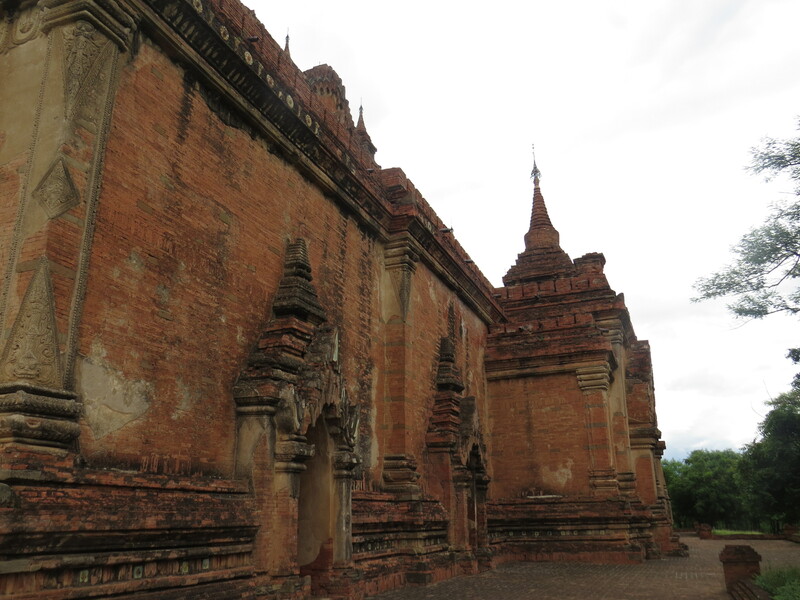 The weird thing about Bagan is that after its heyday, it quickly declined and became largely abandoned (similar with Angkor in Cambodia), with different theories put forward such as the invasion of Mongols. Whatever the case, it stopped being a city and gradually became a village. 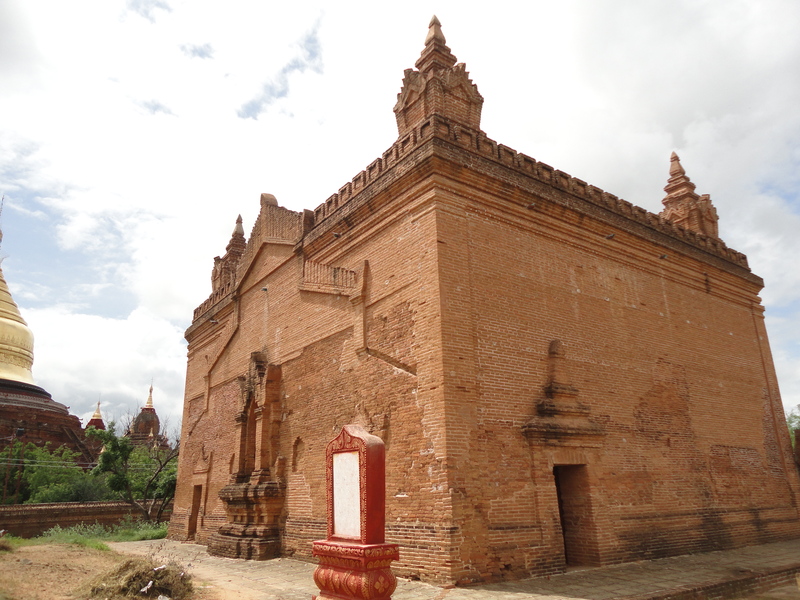 If you stay in Bagan, there are actually 3 settlements – New Bagan, old Bagan, and Nguang U, with old Bagan, where the original village used to be, the most expensive and the nearest to the actual temples. 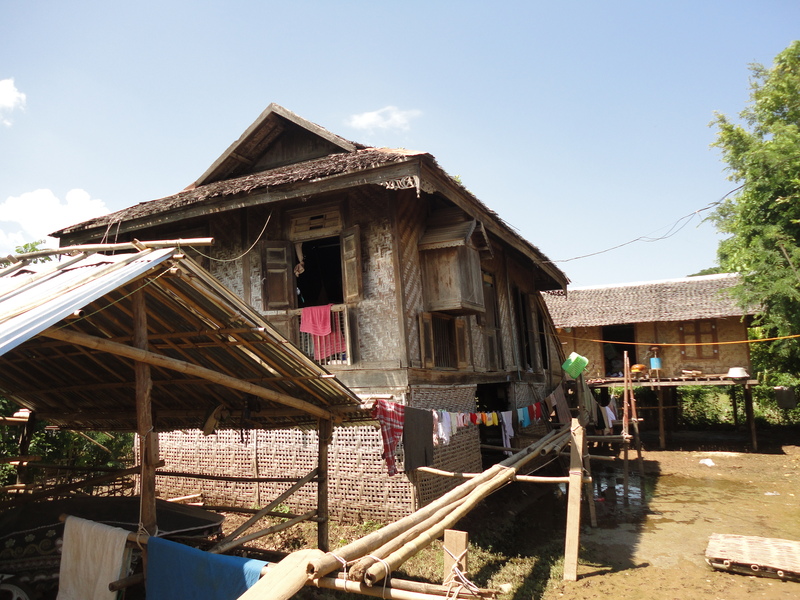 However, the other two settlements are close by and are just minutes away by car or bike. 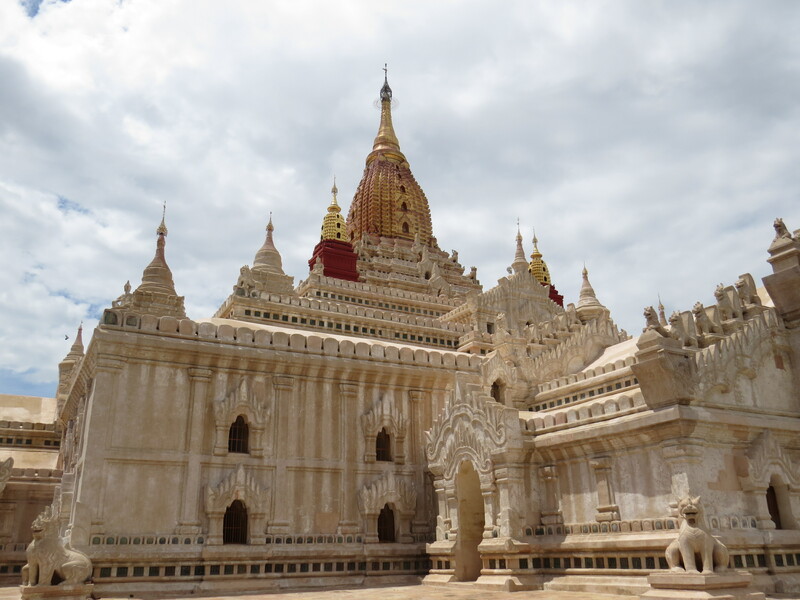 I stayed in New Bagan and hired a car and driver for the first full day there. You can also hire a horse and carriage and I was tempted to do that for the second day. Instead, I decided to try an e-bike, an electric bicycle that requires no pedaling and is like a slower scooter. These are very common in China but I’d never ever ridden one before during my time in Beijing. Anyways, I managed ok, despite almost getting lost and almost toppling into a huge muddy puddle when I decided to cut across on a dirt path. Hence I decided to do the same thing for my third day. Riding the e-bike was quite fun, especially as the streets did not have much traffic, and it was much cheaper than hiring a driver. To be honest, two full days is enough to appreciate Bagan’s temples. 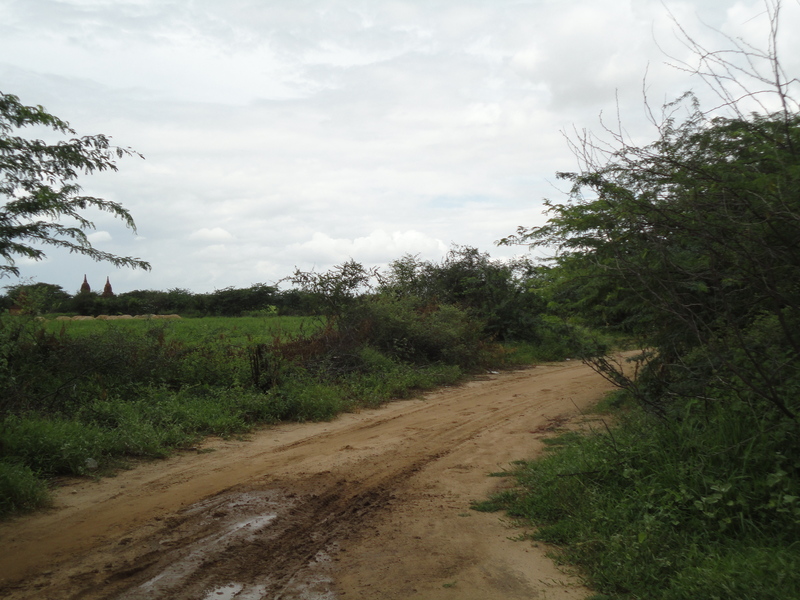 How I got to Bagan was quite interesting too. I flew from Yangon on a domestic flight on a small turboprop plane. However, it wasn’t a direct flight. Instead, it flew to Mandalay first, where some people got off and others got on, then it flew to Heho (where you can go to Inle Lake, another of the country’s most popular destinations), where the same process repeated itself, before then flying to another town and people got off and on again, and finally Bagan, my stop. Basically, it was like an air bus. 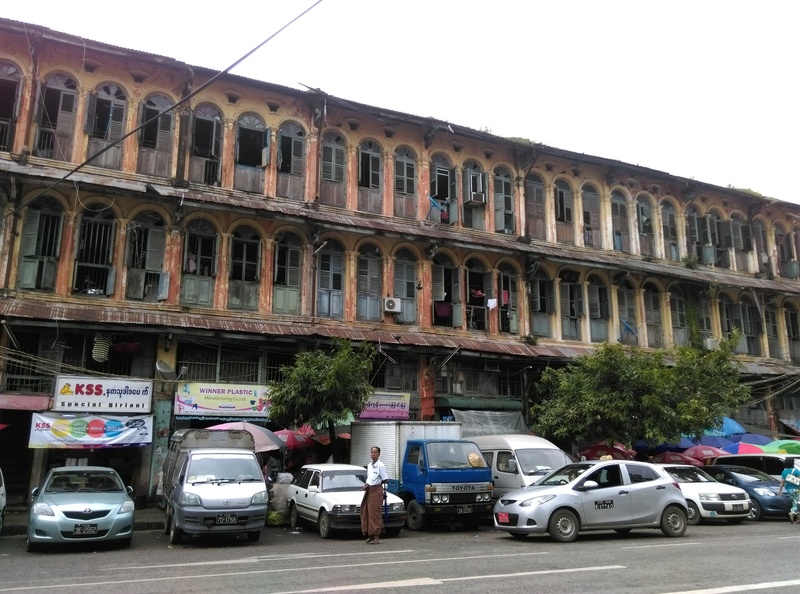 As Myanmar’s largest city and most commercial hub, Yangon, or Rangoon, represents the country’s progress, which is most apparent in the tremendous number of cars everywhere on its streets. But while the heavy traffic represents economic growth and modernity, the city’s architecture still shows the country is very much a developing country. It also reflects the country’s British colonial heritage and its cultural diversity. 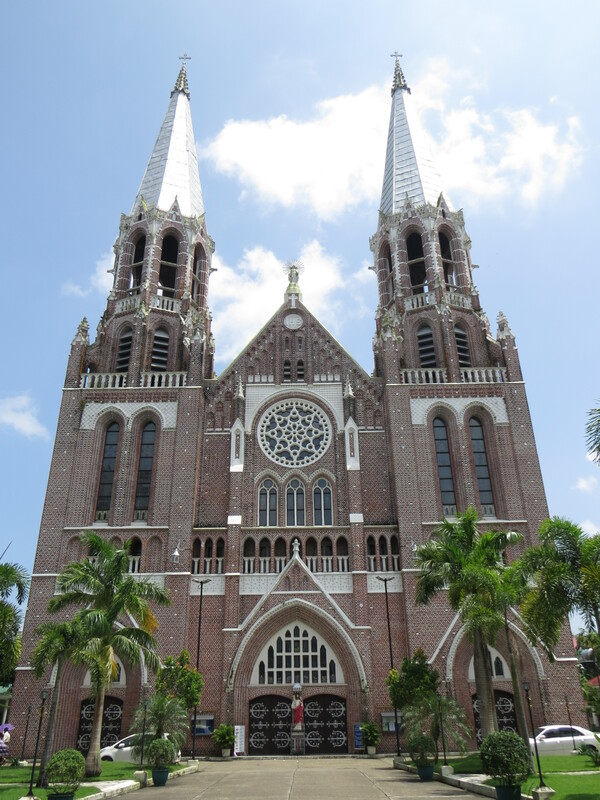 Colonial-era buildings are everywhere from regular apartment buildings to the gated villas by the city lakes, but the most impressive examples are the early 20th century colonial-era government buildings, cathedral and hotel located downtown near the riverfront. 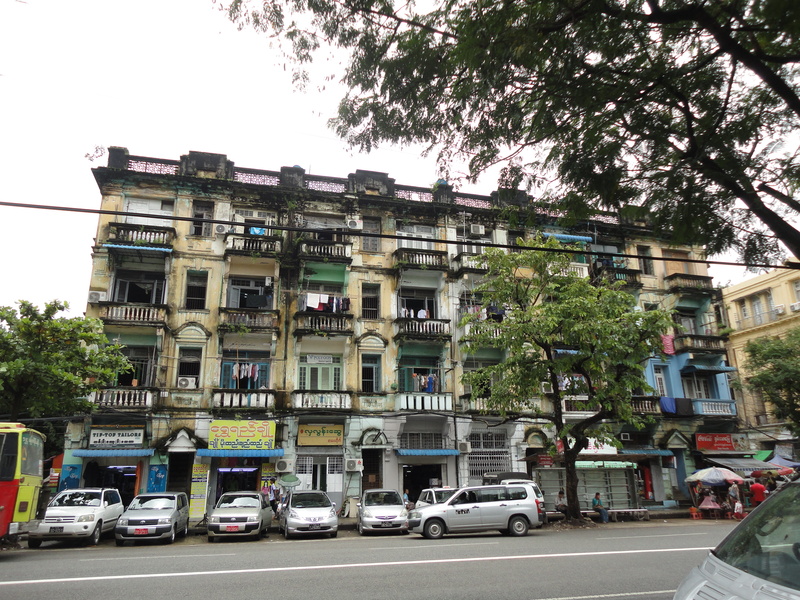 It’s been said Yangon has the most existing colonial buildings in the region, which would be impressive given the competition – Saigon, Phnom Penh, Singapore, Kuala Lumpur etc. 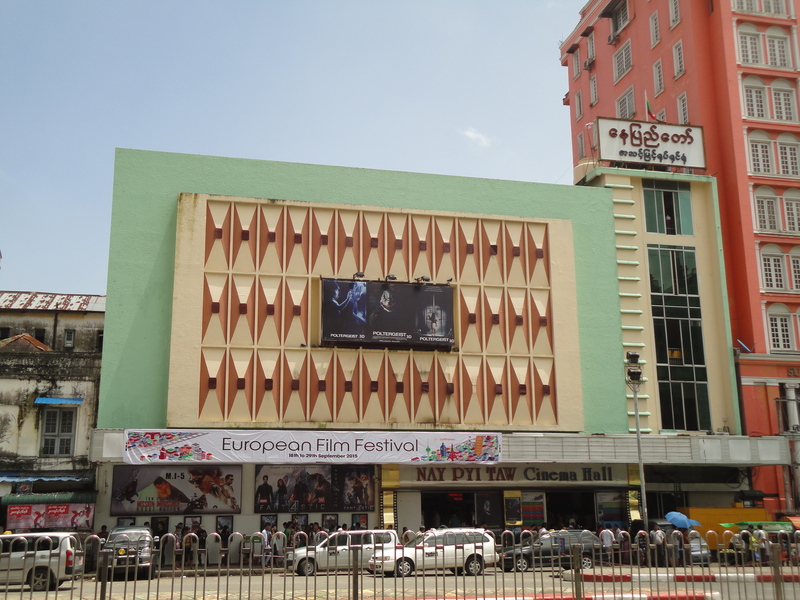 Yangon exists specifically because of the British because it was they who built it in the mid-19th century. 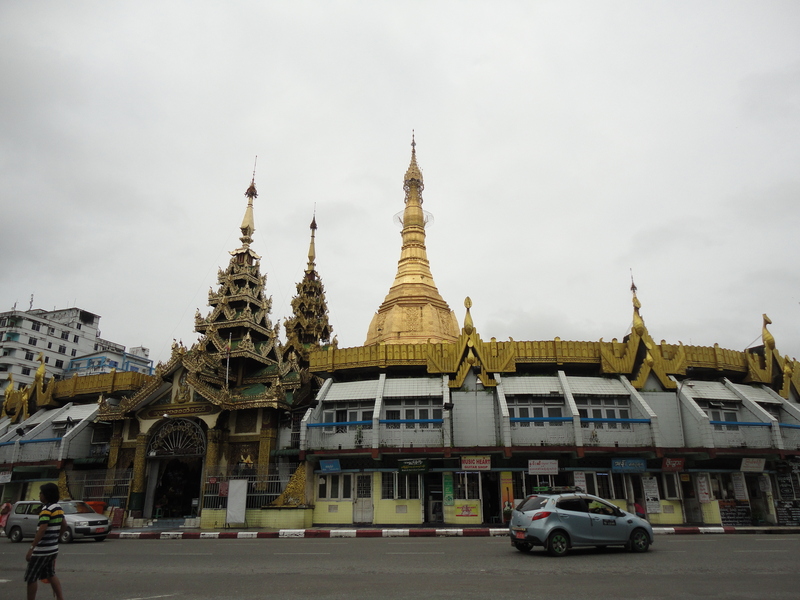 Yet ironically but also fittingly, the city’s main landmark, besides Shwedagon Pagoda, is Sule Pagoda, very much a Burmese building and which sits at the center of a roundabout. 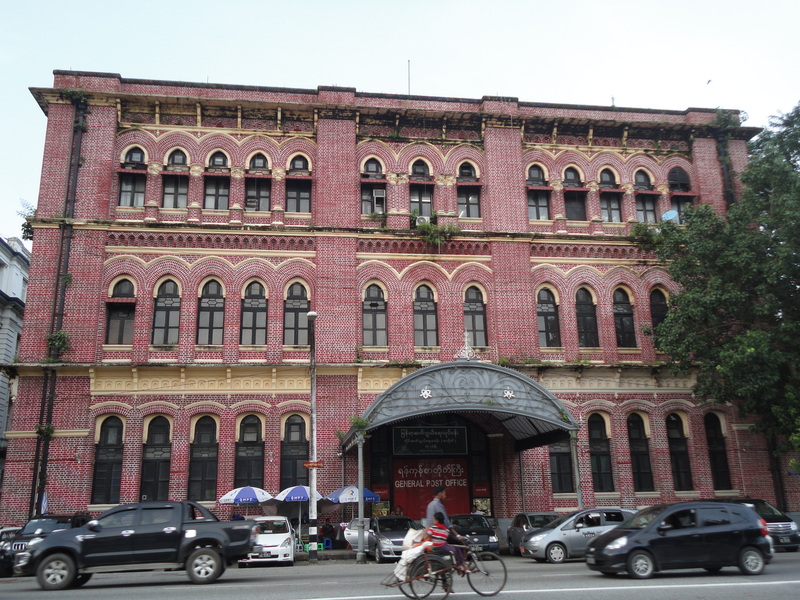 South and East of Sule Pagoda are where the most impressive colonial buildings are, including the Secretariat, the riverfront Strand Hotel and the central post office. 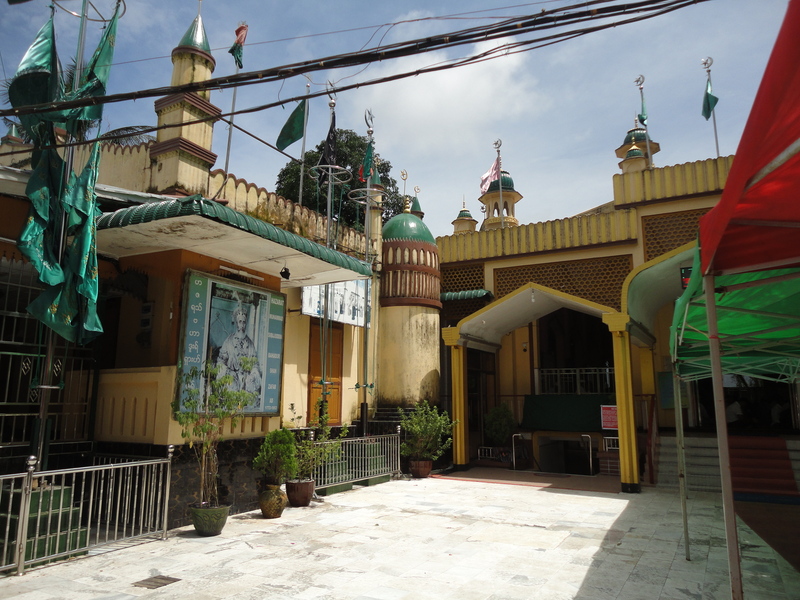 Besides the colonial buildings, Yangon has many different types of religious buildings. 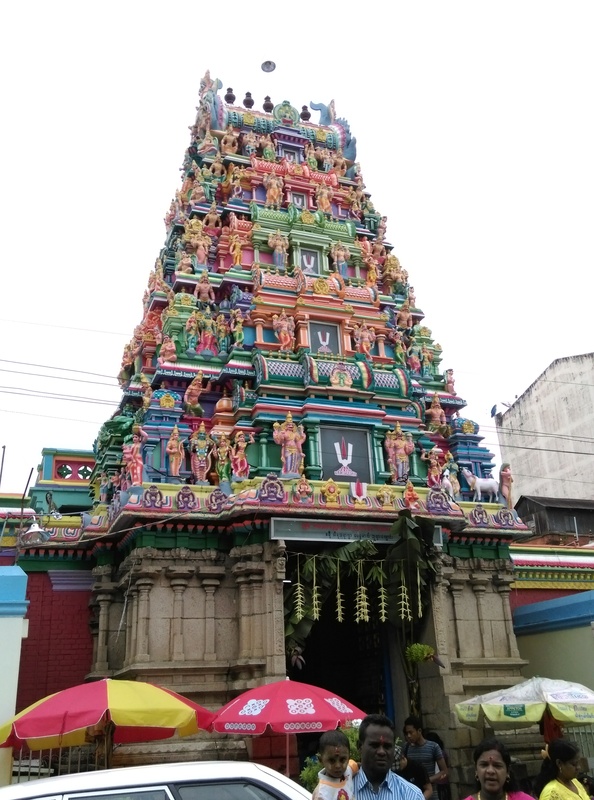 There’s a towering immaculately-maintained cathedral, mosques and Chinese temples, and Hindu temples adorned with tall mounds covered with colorful statues above their entrances in the South Indian style. 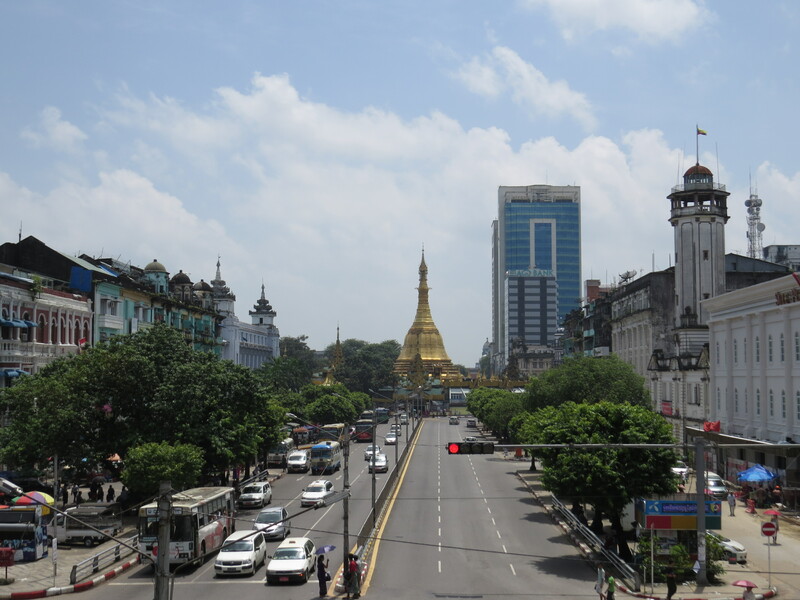 Yangon is also multiracial, with the Burman majority (which the country’s former name Burma was derived from) coexisting alongside Mon, Rakhine, Indian and Chinese minorities. The street where I stayed in when I flew into Yangon was part of the “Chinatown” district and my hotel manager was a local Chinese who spoke Mandarin to me. Even with the Burmese (Burman, Mon, Karen etc) who weren’t Indian or Chinese weren’t homogenous, with there being a wide array of skin tones and hair waviness. 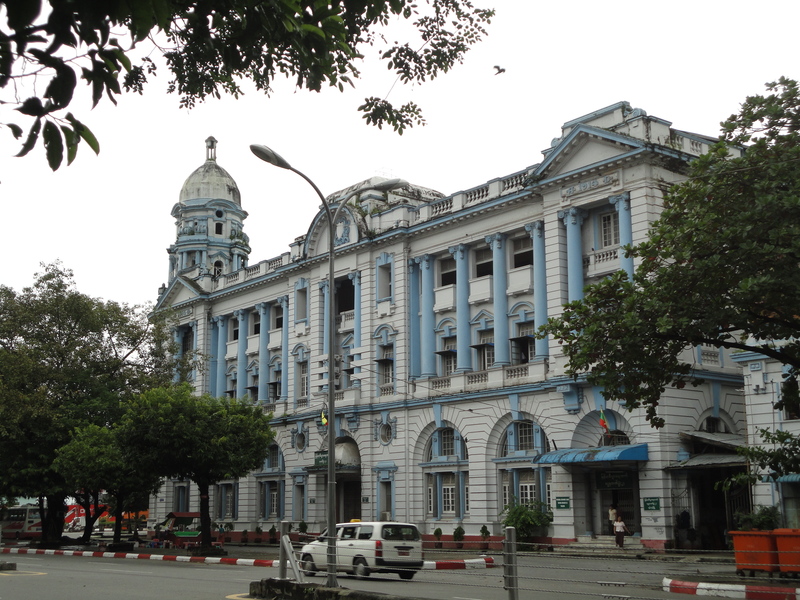 The combination of British colonial buildings, the noticeably multicultural population and the use of English makes Yangon look and feel very different from say, Bangkok, Hanoi or Phnom Penh, and I wonder if it resembles South Asia, given Myanmar borders India on its west. Besides Shwedagon Pagoda and the colonial buildings, other places of interest I went to included the national history museum, which was interesting but not too well maintained, and whose main attraction was the impressive Lion Throne, a large golden throne filled with exquisite carvings that Burmese kings used to sit on. I also went to the grave of Bahadur Shah Zafar, the last emperor of India who was exiled by the British to Yangon after the failed Indian Mutiny in 1857. But, I did not get to see the actual grave because when I visited the site, I found out it was a shrine and being Friday afternoon, there were services going on. Hence why the site is called a Dargah, an Islamic shrine built over the grave of a saint, who in this case is Bahadur Shah. The guy by the gate was kind enough to wave me in when I told him why I was there, but I saw that the actual grave was in the basement where the women were (men and women worship separately in Islam). I could have still gone right in and played the dumb tourist (I am obviously not muslim) because I was so close, but I decided to let discretion and common sense prevail and walked back out without seeing the grave. At night, the streets near “Chinatown” are alive with teeming numbers of locals sitting by roadside food vendors having dinner. 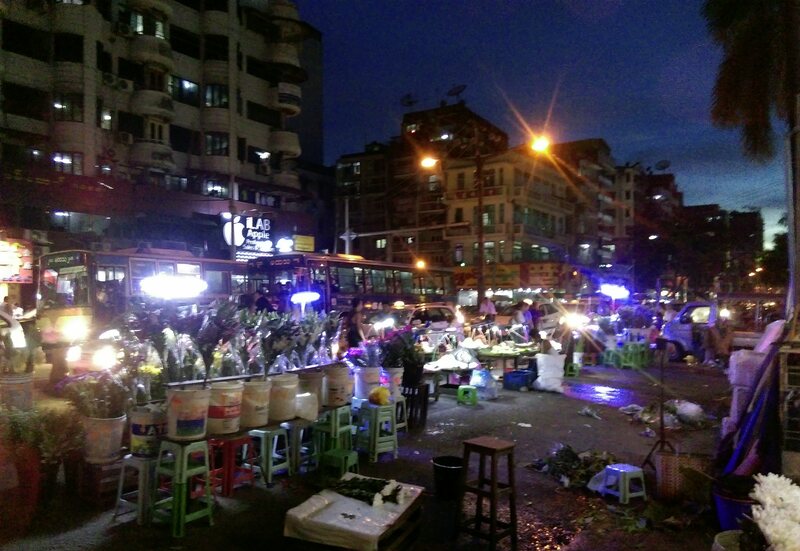 It might be called a night market except that it is a lot more casual and informal. The downside is that there aren’t much restaurants so I did resort to eating fried rice from these vendors which came up to something like 50 cents US. 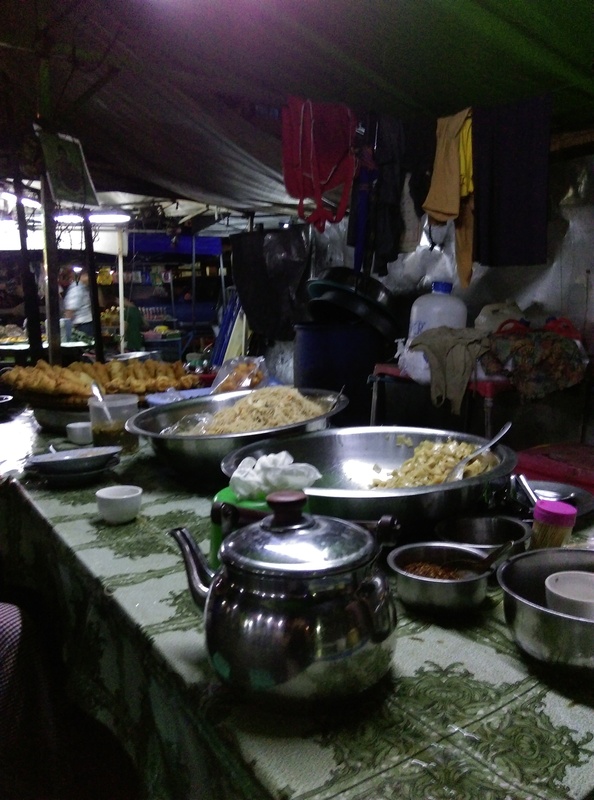 When I came back to Yangon from Mandalay, I stayed on the other side of the city in the east where there were more formal restaurants. I had a very good lunch at an Indian restaurant featured in the Lonely Planet, but I had worse luck when I had a mediocre dinner at a relatively modern restaurant. To top off the not-so-good experience I was given water, then charged for it, with a service charge on everything, and the waitress pretended not to understand English when I asked her about this. I learned my lesson- sometimes fancy restaurants in underdeveloped countries are often not worth it (I’ve had better experiences in Phnom Penh and Hanoi). 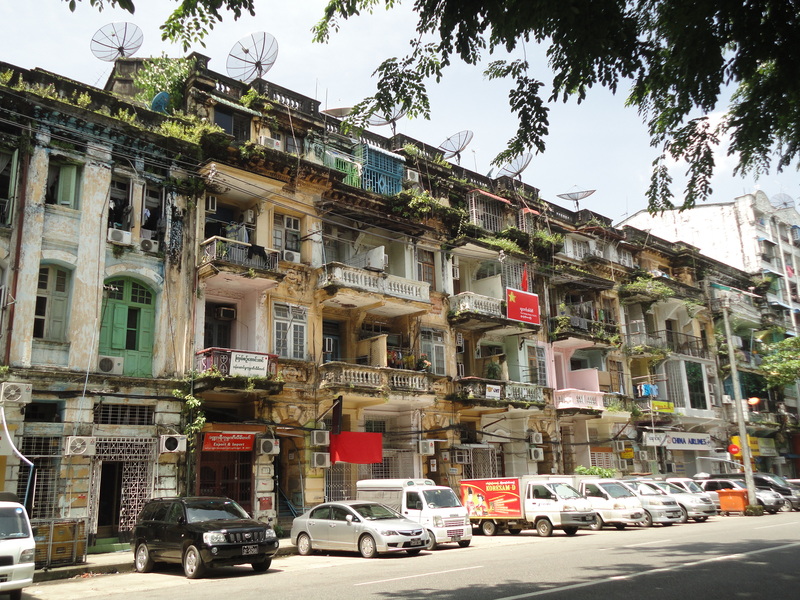 I have to say Yangon is not the most attractive city and a lot of its buildings are in need of a good scrubbing. 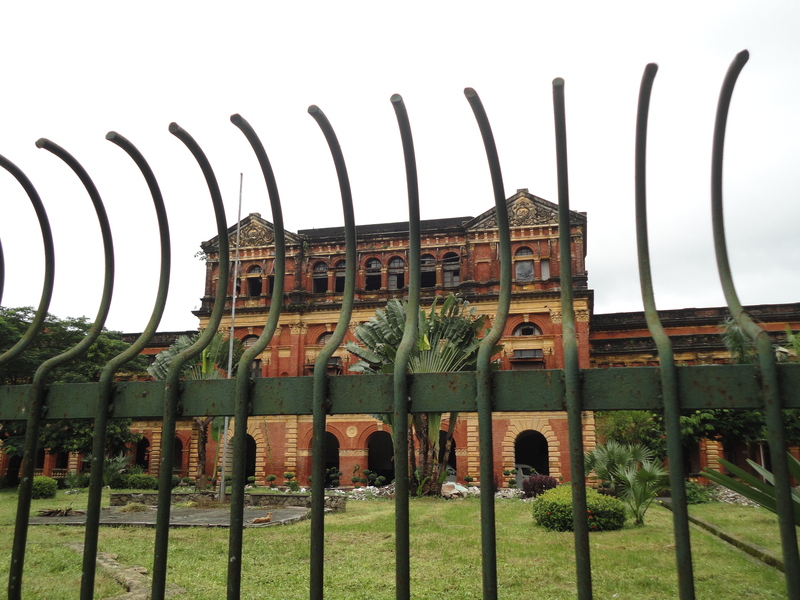 Even some of its most grandest colonial buildings were abandoned or rundown. The ones that were maintained look fine and remind me of Trinidad, which was also a British colony and has some decent colonial buildings albeit in a more tropical climate. 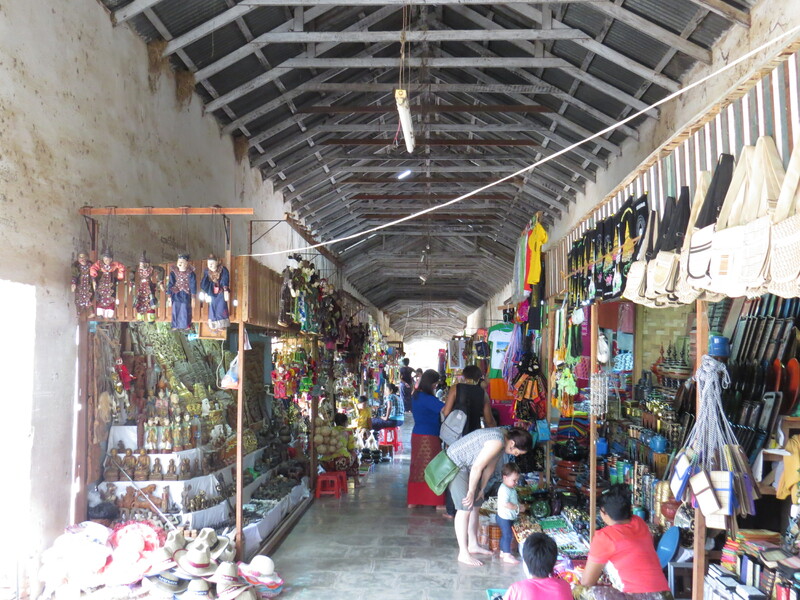 In general, the city lacked the charm and the attractiveness of even Phnom Penh, which boasts a nice riverside walkway and clean, tree-lined roads with not as much traffic, and I certainly erred by spending almost four full days there. Dargah of Shah Bahadur, the shrine above the grave of the last Mughal emperor of India. The grave was in the basement which was accessed by the stairs in the middle, covered by the small roof. Sneakily-taken photo of my dining spot for two nights. The food was cheap and tasty, but not sure I’d have dined there twice if there had been more choices.